Description: 292” Length 42”/60” Diameter, Farrel Corporation Heavy Duty 2 wheel Roll Grinder with floating heads. Capacity: Max. Roll Dia., on center with full size wheel- 42”; Max. Roll Dia., above centerline- 60”; Min. Roll Dia., ground on centerline- 7”; Max. Roll Face ground- 292”; Max. Carriage traverse- 320” plus; Max. 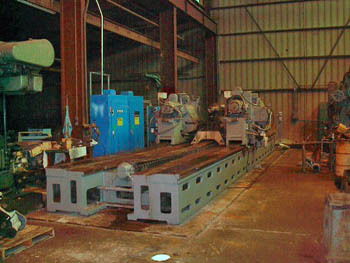 Crown/Concavity of roll - .400”; Grinder Bed: Material – High grade Meehanite Iron; Ways – inverted “V” type, cast separately from bed, close grained alloy construction; Anchoring – 4 rows of special leveling screws spaced on 4’ centers, and an equal number of hold down bolts; Headstock: Material – High grade Meehanite Iron; Work speeds, rpm, programmable - 4 – 24rpm; Work Motor, D.C. - 20 hp, 400/1600 RPM; D.C. Drive, new 2010 – ABB; Wheel heads: Grinding Wheel Dia., std. - 20”; Grinding Wheel Face, std. - 3”; Spindle speed range - 700 – 1750 rpm;Grinding wheel motors, D.C. - 15 hp; D.C. Drives - Harland Simon/ABB (new); Infeed Assemblies: Rough wheel infeed hand wheels for manual feeding on each wheel head. ; Carriage: Material – High grade Meehanite Iron; Carriage Speed, programmable - 2 - 60 ipm; Carriage Motor - 5 hp D.C.; D.C. Drive - Harland Simon / Electroflyte; Traverse screw diameter - 4 5/8”; Carriage Ways, center-to-center - 72”; Over all width of each way - 8 ½”; Over all length of carriage - 98 ½”; Swing rest design on carriage to support adjustable pivot supports and wheel assemblies; Directional reverse of carriage travel with use of reversing and safety over travel limit switches; Dimensions: Approximate size of inertia block required - 45’ x 9’6” x 4’; Approximate weight of machine - 140,000 lbs. Includes: Tooling and Roll Stands; Crowning Devices for Manual Crown Control; Engineering Files and Operating Manuals on Roll Grinder; One rebuilt electrical system containing all DC Drives, Motors, Magnetic Starters, Relays, Fuses, more. ; One New Operator station containing all operator controls; controls include on/off switches, and speed control for grinding wheels, forward/reverse, e-stop, and speed control for carriage. On/off and speed control for roll drive included on control panel. Machine can be seen under power, mechanically and electrically turned over.